Jack Hanley Gallery is excited to present Woman on Top, Emily Mullin’s first solo exhibition with the gallery. 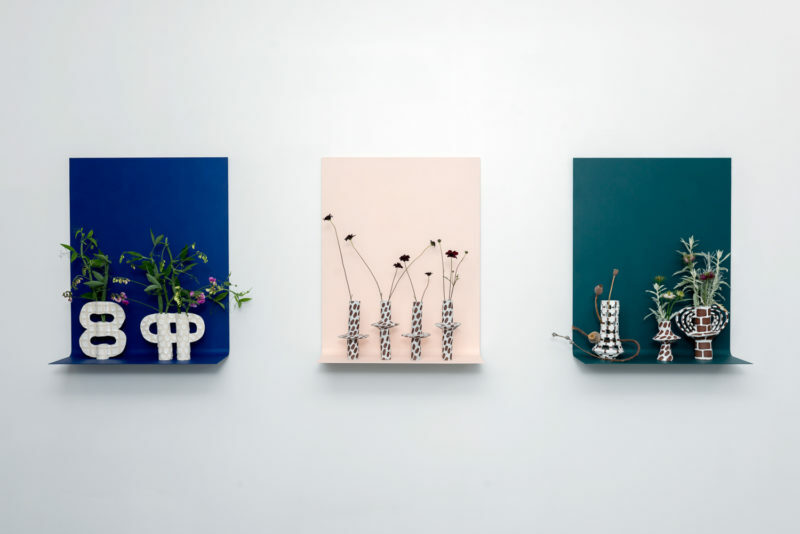 Woman on Top presents a new series of wall-mounted reliefs of ceramic vessels and flowers on hand-painted steel shelves. Mullin’s three-dimensional still lifes explore the potential of the frame, the tradition of still life painting and forms of representation. The bent displays on which the vessels and floral arrangements are placed replicate the form of the cyclorama – the photographic space that dissolves the line between floor and wall. By extending the shelf’s patterns onto the actual space of the gallery’s walls, Mullin spins a web of meta presentations between the flat image, object, and real space.